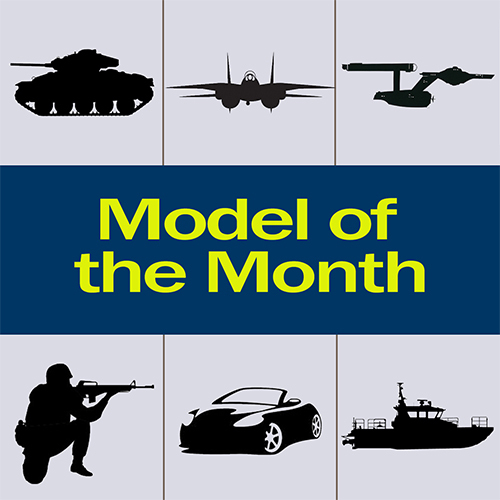 With this six month Model of the Month Membership, you will receive one plastic model kit sent to your home each month. Model of the Month shipments are sent around the 15th of each month. With your first shipment (only for beginner and intermediate memberships), you will also receive a MegaHobby.com tool pack, which includes a basic hobby knife, a tube of plastic glue, a pack of modeling sandpaper and a sable brush set. The Model of the Month Club membership makes a great gift for the modeler in your life, or even for yourself if you want to try something new. It's a gift that keeps on giving month after month! No matter what age you are, where you're from, or what you do, model building is one of the greatest hobbies and one of the most popular hobbies in the world. Nothing beats the satisfaction of building a model from scratch and creating your mind's view of the finished product. It's also great to display at home, in the office, and show off to those you love -- remember, you built it! Model of the Month Club memberships are charged in full when the order is placed. You can select from the drop-down menu which category you would like to receive. If you want some extra added fun, pick "Surprise Me!" and we will send out a different category of model kit each month for the duration of your membership. Model of the Month memberships are only for customers in the United States. Snap: We will only send snap together kits that do not require glue or paint. This is for young beginners. The snap kit package does not include the MegaHobby.com tool pack. Beginner: We will send very basic models, all of which require glue and paint to complete. Intermediate: We will send intermediate models that require a bit more time and dedication to build. All of the kits will require glue and paint to complete. Advanced: We will send advanced models that require significant time and dedication to build, along with other resources. All of the kits will require glue and paint to complete. The advanced package does not include the MegaHobby.com tool pack.